Based on Swedish author Jan Guillou's trilogy of books, Arn: The Knight Templar tells a story of diligence, composure, and love in the face of tumultuous circumstances -- a pretty familiar topic for historical epics, fictionalized or not. 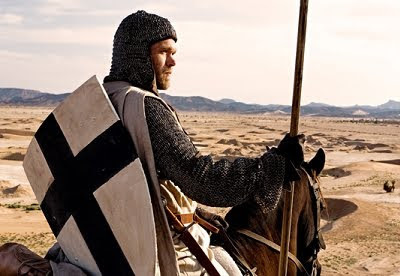 The film takes place in the mid-12th century during the time of the Crusades, where Arn (Joakim Nätterqvist), a young monk raised in a convent since childhood, learns the ways of battle from a fellow practitioner who used to be a Knight Templar. He eventually returns to his land and family as a composed, skillful man trained in the ways of battle and piousness, while his homeland's caught in the middle of a blunt-headed clan dispute. Though the wars (The Crusades) he unwillingly fights in obviously have nothing directly to do with the clan struggles, the story of a helpless boy primed in the ways of dignity and combat for warfare sounds like something we've heard before -- just in another place, amid another conflict. And yes, to top it off, he meets a woman when he returns home, someone who will become his inspiration. Arn: The Knight Templar's formula shares more than a few similarities to other period action-dramas, namely Braveheart in its structure around a maturing man and Kingdom of Heaven in thematic essence. Yet, is there anything necessarily wrong with borrowing from other productions to tell its own passionate story, one filled with like-minded blade-clanking and patriotic chest-thumping? In this case, no; Peter Flinth's picture, a joint venture produced by Sweden and four other countries for roughly $30 million, molds this arrangement into its own distinctive, handsome piece of historical fiction. With polished sincerity, it takes the grandness of scope that typically propels entries in the genre and marches through the formula, concerning itself less with battle set pieces and more with the period's misguided grasp on virtue. The big difference comes in Arn's inspiration, his honest and simple love for a woman named Cecilia (Sofia Helin), and the fact that she's alive instead of having her death vengefully drive him through the Crusades. Arn: The Knight Templar instead tells a conflicted romantic tale about their unwanted separation, decreed over a controversy among his people; Cecilia, with child and out of wedlock, is sent to live a life of holy servitude in a nunnery, under harsh scolding and whip-lashing disguised as a pathway to God's righteousness. Arn, serving his side of the punishment, sets off to fight in the Crusades with the skills he's been armed with from his early years with the former Knight Templar. Their reliance on one another as motivation, just to see each again through their circumstances, is skillfully used in the film as a subdued driver, mixing with their religion-bound conflicts in a way that veers from romantic sappiness into an authentic projection of longing and perseverance. During Arn's time in the Crusades, Arn: The Knight Templar exercises the bulk of the film's production budget with gritty, reality-bound war sequences that rely more on practicality and earthy tension than chaotic lavishness. You're not going to see a lot of heads and arms lopped off or blood spraying, aside from one grin-inducing brutal maneuver from Arn -- and even that takes place before the actual war. The Moroccan-shot battles instead swirl with dust and clanking metal in a way that feels authentic and less aimed at sating action hounds, tapping into the harshness and survival within the conditions. And, moreover, they're few and far between, used strategically for storytelling and only hitting a handful of wide-scope battles. Whether the lack of visceral engagement takes away from the brutality of war will largely be in the eyes of the viewer, but the restraint on action sequences actually serves the film's more dramatic temperament rather well -- especially considering the conversations between Arn and his opponent, Saladin, about fabric of honor and warfare. Arn: The Knight Templar instead concerns itself with the demanding events that unfold in Arn and Cecilia's lives and the way that religion's convictions force them into dire circumstances, though the film opts to say more about belief than about the era's archaic perception of religion. In that respect, it's hard not to think about František Vláčil's The Valley of the Bees, a more thought-provoking existential piece that deals with a knight struggling with his unsolicited ascription to holy service. Arn, unlike the character in that film, finds peace within his early years of training and his belief in God, whereas Cecilia's oppression at the nunnery -- complete with nasty quips from the head nun about Arn never returning -- exemplifies the misconstrued institution that the Crusades are fighting for. The depiction might not be dynamic, mostly just communicating the period's harsh and volatile view on maintaining religion, but it's still an evocative magnet for both characters as they bide their time until a reunion. Though heartfelt and resonant by way of two nuanced performances from Joakim Nätterqvist and Sofia Helin as Arn and Cecilia, not to mention photographed splendidly by The Girl with the Dragon Tattoo cinematographer Eric Kress, Arn: The Knight Templar can't avoid sluggishly moving through its final acts due to heavy pacing. It strikes a balance between boisterous conflict and focused character turmoil that feels every bit as long as its 133-minute runtime while nearing an affecting-but-foreseeable close, whereas other epics of its type generate a heightened level of momentum nearing the climax. But as Arn's horse gallops in front of his compatriots before be delivers an inspiring speech, all but wielding a Claymore and sporting blue facepaint, the picture still feels justified amid its overlong familiarity. His story focuses on presevering in the face of war while maintaining goodness and fortitude, a more subtly moving point but nonetheless one worth experience in this medieval setting.